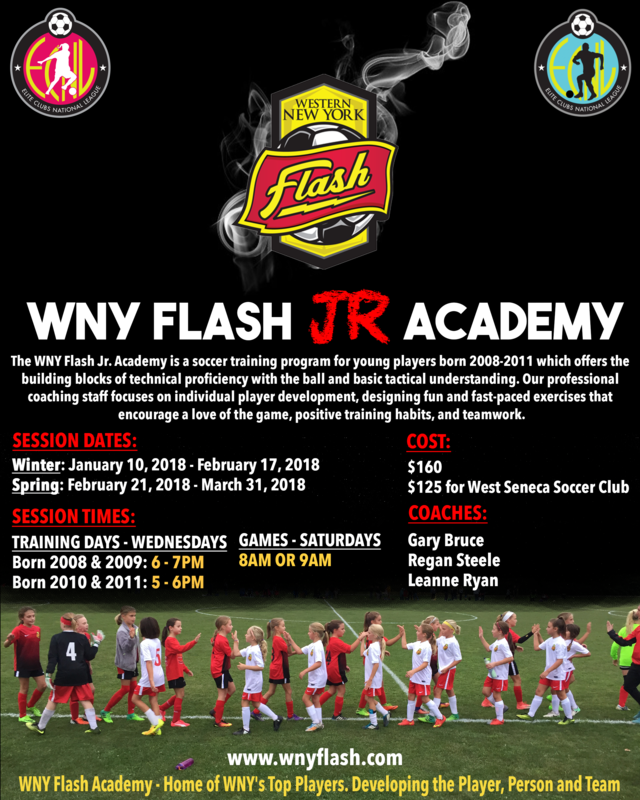 Elma, New York (December 5, 2017) -- The WNY Flash is excited to announce that they have restructured the WNY Flash Jr. Academy program for 2018 and beyond. The program will consist of 2 (two) days per week comprising of one training session and one “game day.” The Jr. Academy will focus on individual player development in 2 (two) six week blocks. The Jr. Academy curriculum is designed to encourage a love for the game, positive training habits and the teamwork skills needed to progress through all levels of youth soccer. The training environment is structured to creating small, fast-paced scenarios that encourage the development of critical thinking and decision making needed to play soccer at a higher level. Games on the weekend follow US Soccer Guidelines, using small-sided fields and small goals to maximize skill development and the amount of touches each player gets in a competitive environment.